In late 2012 there was a lot of adverse comment about the paper Lewandowsky, Oberauer & Gignac – NASA faked the moon landing:Therefore (Climate) Science is a Hoax: An Anatomy of the Motivated Rejection of Science (in press, Psychological Science). I did my own quick analysis using pivot tables, which was referred to elsewhere. This was published at the blogs Wattsupwiththat, JoanneNova and BishopHill blogs. The poll is still available to view. A few hours ago Jo Nova published Shollenberger’s initial findings, as “Warmists Are Never Wrong, Even When Supporting Genocide“. Using the same methodology that Lewandowsky et al (LOG12) “demonstrated” that those who reject the climate religion have a propensity to believe in cranky conspiracy theories, Shollenberger showed that believers in catastrophic global warming have a propensity to believe in genocide, paedophilia and human trafficking. Like for the LOG12, I have run the data through Excel pivot tables to reveal that Shollenberger was successful in undermining LOG12. For the LOG12 I split the respondents according to the average response to the four LOG12 “climate science” questions. Similarly, with the Shollenberger survey, I have categorised the respondents according to response to the three questions on global warming. This time I weighted the responses in relation to belief in catastrophic anthropogenic global warming. First I changed the 1 to 5 response to a 0 to 4 response. The weightings were then 1 for Ques 1, 2 for Ques 2 and 4 for Ques 3. By dividing by the maximum score of 28, I obtained a “believer” percentage. Questions are below. Also, I have looked at the percentage with the outlier scores, along with the average scores. Some brief preliminary observations that stand out from the pivot tables. These are the green bordered summaries below and the responses to the individual questions at the foot. Compared with LOG12, Schollenberger gets three times the responses and takes a week rather than 18 months to publish the results. Schollenberger shows the result of only publishing a survey on only one side of the global warming divide, whilst trying to analyse the other side. The vast majority of responses are from people you are not targeting. The three times response, in a much shorter time frame indicates that sceptics are far more interested in the subject of global warming than the believers. Proportionately, more far sceptics seem to visit “believer” blogs than “believers” visit sceptic blogs. This should not be controversial. Sceptics look to understand the view they oppose, whilst “believers” look for confirmation. Climate change is no different from many other areas, including many of the softer sciences. Schollenberger, in his three questions on belief in global warming captures a broader possible range of beliefs in the climate science, than LOG12 does in four questions. In particular it is possible to distinguish between those who believe humans have caused most of the recent warming, but it is fairly trivial, and those who (like the MSM) believes we are all doomed unless we abandon out cars for bicycles and go to 2W lightbulbs everywhere. The LOG12 questions were designed to polarize views into “pro-science” and “deniers”. Schollenberger thus achieves very quickly what millions of dollars spent on opinion surveys conceals. The extreme alarmism that justifies policy is not held by the majority who believe that anthropogenic global warming is an issue. Both surveys were uncontrolled for “scam” responses. That is for those on one side to be able to mischievously post as an opponent, but with reprehensible views. The Schollenberger survey had more, and (to a lesser extent) a higher proportion of scam responses. Given the knowledge of LOG12, this is not surprising. But, given the proportions of non-scam responses, “believers” seem to have a greater propensity to scam “sceptics” than the opposite. Thus Schollenberger can demonstrate that Lewandowsky’s conclusions are as much based on scam responses as his survey. Number of Responses to questions 4 to 13, in relation to CAGW score. This article analyzes the response of the climate blogosphere to the publication of LOG12. We identify and trace the hypotheses that emerged in response to LOG12 and that questioned the validity of the paper’s conclusions. Using established criteria to identify conspiracist ideation, we show that many of the hypotheses exhibited conspiratorial content and counterfactual thinking. In order to respond, it is first necessary to gain a proper understanding of the original questionnaire and the conclusions the authors reached. This posting starts with examining the forty questions to see if the questions were balanced or designed to support the authors’ hypotheses. The full list can be found at Joanne Nova’s website. There were two areas that the questionnaire tried to test around the motivated rejection of climate science – free-market ideology and conspiracist ideation. The first six questions dealt with belief in free markets. There are a number of issues. First, those who believe in free-markets are libertarians. They value individual liberty above all else and see laissez-faire capitalism as the only means to achieve this. The reason for many rejecting climate change policies is a belief that it would lead to a suppression of individual choice. They can also see that those who oppose the “scientific” consensus are stigmatized, and criticism suppressed. They might see historical parallels in the rise of communism, Nazism and in the McCarthyist era. Without such questions, rejection of the consensus could be viewed as much shallower and more dogmatic than is actually the case. Second is that these questions are framed by somebody who clearly does not understand nor like the market mechanism. Most free-marketers would not view it a structural system, but a spontaneous order. Nor would they see a market mechanism as being antagonistic to development or preserving the environment. Third is that there are a large group of people who may general reject environmentalism, but be quite centrist in their political views. Conversely, there might be some people who are highly antagonist to capitalism, but also sceptical of global warming. Without questions for a broad range of political views, responses will be more polarized than is actually the case. In conclusion, these six questions seem aimed at marginalizing sceptics. When I first looked at these questions it struck me that some were related to the climate issue. Therefore I left them out as biasing the results. I think there are five broad categories of question, which I have colour-coded. Blue questions are neutral to the climate change issue. Red questions are those that see the climate consensus as some sort of conspiracy. Green questions are those that see motivations for rejecting the climate consensus as some sort of conspiracy. Pink Questions are conspiracies that those who reject the climate consensus might believe in, but unrelated to the climate issue. Brown Questions are conspiracies that those who accept the climate consensus might believe in, but unrelated to the climate issue. What is clear is that there are no questions that ask if scepticism was underpinned by of some sort of conspiracy. A common theme is that denial being promoted by secretive funding by fossil fuel interests. For instance searching “Koch” on Desmogblog reveals 2440 hits. With such a question, there would have been symmetry. I have rated question 7 (WMD) as possibly appealing more to the climate consensus types, as they tend to be more to the left of centre and certainly are mostly anti George Bush. This was the only question NOT reported in the LOG12 paper. So two conspiracy-type questions specifically appealing to sceptics, and none (reported) that no conspiracy-type questions specifically appealing to “pro-science” types out of 14 would have been sufficient to bias the results towards “finding” that sceptics are more likely to believe in conspiracy theories. There is an complete absence of questions about future projections of accelerating warming; or of future catastrophes well in excess of anything so far observed; of the strength of the science or the uncertainties; our trust in what scientists are telling us; nor of the ability of policy to do anything successfully combat it. These are the questions that many sceptics, including myself, are grappling with. As Warren Meyer concludes, it is the projected catastrophe that sceptics “deny”. Joanna Nova, Lord Monckton, Prof Richard Lindzen, Anthony Watts, Bishop Hill (Andrew Montford), Prof Bob Carter and Lord Nigel Lawson all recognize to some extent that humans might be causing some global warming and that this may continue. Many, like Lord Lawson (and myself) conclude that the policies to “combat climate change” are both ineffective and hugely harmful to economic prosperity, yet there is no recognition of this aspect. The whole thrust of the questions appears to be one of polarization, making sure that those who reject the consensus is as large as possible. Two questions on the environment, that quite rightly see where people stand on other environment issues. Six psychology questions. They do not appear in the conclusions of the paper. This might be because there was no relationship to respondents’ self-esteem and their views on climate science. There are two sections. Three questions on what the respondent thinks about three propositions and three questions of about where the respondent thinks the scientific consensus lies. The questions are somewhat sneaky. That HIV causes AIDS and smoking causes lung cancer is quite clear to the vast majority. But human CO2 emissions causing “climate change” is something more ambiguous to anyone who thinks about the issue. Does a small amount of warming really mean a change in the climate? Is it a change of climate system – from rainforest to savannah for instance? Or is it the same climate type, but with more extreme weather events. As a political concept in the minds of the authors it might be quite clear, but to respondents who have a less polarized view of the world it may not be so clear. The ordering is quite clear though. The questions are viewed by the question-setters are equally valid, so answering the third question differently is indicating to the respondent something of how they are viewed. The questions appear to have been devised to obtain verification of the hypothesis that rejection of climate science is motivated by belief in free-market ideology and due to a conspiracist ideation. In more colloquial language, the questions were biased to support the view that denial of climate science is due to free-market ideologues who are incapable of evaluating the evidence. The questions on free-market ideology betray the question-setters prejudices. The questions on conspiracy theories are show something of the question-setters own beliefs or a deliberate ploy to bias the results in the desired direction. The questions on climate science show a desire to show consensus amongst pro-science views, along with trying to ignore the possibility that policy questions are a matter of contention as well as the “science”. Jo Nova posts on Stephan Lewandowsky’s analysis of Hurricane Sandy. Below is my comment, with the relevant links. Lewandowsky has a lot to say about the overwhelming evidence for smoking causing lung cancer, but in substance has just this to say about the impending catastrophic global warming. Trends such as the tripling of the number of weather-related natural disasters during the last 30 years or the inexorable rise in sea levels. Climate scientists predicted those trends long ago. And they are virtually certain that those trends would not have occurred without us pumping billions of tons of CO2 into the atmosphere. First, the economic analysis of natural disasters is Lewandowsky’s own. He ignores completely the opinions of Roger Pielke Jr, an expert in the field, with many peer reviewed studies on the subject. 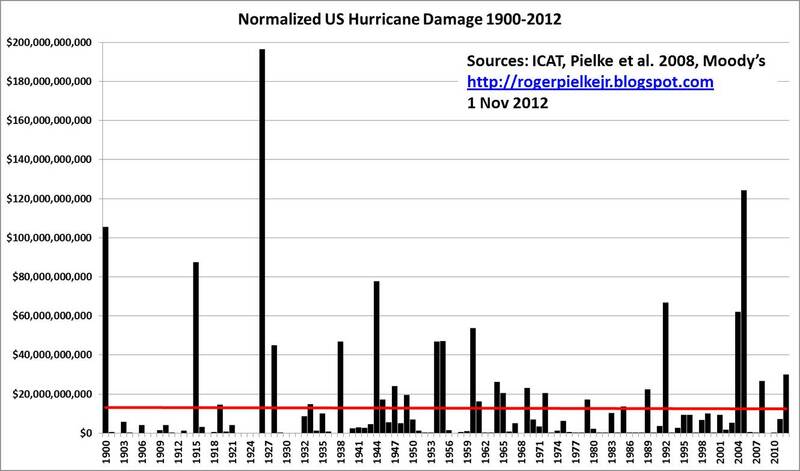 Pielke Jnr has shown there is nothing exceptional in the normalised cost of Hurricane Sandy. Furthermore, a 2009 report showed that New York is vulnerable to hurricanes, and the shape of the coastline makes it particularly vulnerable to storm surges. Second, the sea level rise is a trivial issue. From the University of Colorado graph, it is clear that sea levels are rising at a steady rate of 31cm a century. Third, he claims the predictions of unnamed “experts” have been fulfilled. A balanced analysis would point out that the CO2 levels have risen faster than predicted, but temperatures have not. Last week I posted a proposal for analysing the costly impacts of global warming. Using the “equation”, I would suggest Lewandowsky overstates both the Magnitude and Likelihood that Sandy was caused by global warming. He misperceives the change in frequency (1/t). Furthermore, given than he has a track record in the highly biased use of statistics in his own field, and his deliberate lack of balance, the Weighting attached to anything he says should be negative. That is, like to newspapers of the Soviet Union, if Lewandowsky claims something, we should read between the lines to see what he does not say. However, unlike the Soviet Union we are still able to look for alternative opinions. The following comment was made on Joanne Nova’s blog, in response to a comment by Jonathan Fordsham that Stephen Lewandowsky did not know what he was getting into by publishing his paper and the subsequent defence of that paper. Whilst Lewandowsky may not have known what he was getting into, the aim of the paper was to find further reasons to dogmatically dismiss any views that question the established orthodoxy. It is from a view of science that sees conformity and belief in that orthodoxy as the mark of a scientist. From this conformity is the importance of opinion polls and declarations of belief by scientific bodies to this view. Promoting evidence or hypotheses that contradicts orthodoxy risks being branded a heretic or denier. The alternative, “Popperian” view of science is that progress is often made by over-turning existing hypotheses, or subsuming them within more profound theories. Getting results that contradict hypotheses is a cause for celebration. It then raises a whole series of questions. In this view of science, belief in a specific hypothesis is dangerous. People do not like having their beliefs contradicted, and it would be hugely damaging psychologically to constantly attempt to undermine one’s core beliefs. Belief instead is in finding new understanding of the world by the most rigorous method. The questionnaire, despite all its biases, clearly showed that the vast majority of respondents, whether skeptic or alarmist rejected cranky conspiracy theories. Lewandowsky’s theory about climate “deniers” having a conspiracist orientation was clearly contradicted by the evidence. A team of people then spent 18 months producing the paper. There is strong circumstantial evidence that the time was spent manipulating the data, choosing the best statistical methods to corroborate their story, and carefully phrasing what they wrote to claim the opposite of what the data revealed. The “orthodox” view of science was clearly Lewandowsky’s enemy when the evidence contradicted his hypothesis. He could not publish the full results for risk of his status as a scientist and for future funding of his work. The “Popperian” view would have still allowed publication, as it falsifies a hypothesis that Lewandowsky and others believe in. Descriptive statistics, particularly in the form of pivot tables enable a bridging of the gap between the public pronouncements and the high level statistical analysis that can only be performed by specialists. In empirically-based scientific papers, data analysis by spread sheet enables the robust questions to be asked by the non-specialist and the expert reviewer alike. In relation to Lewandowsky et. al 2012, it highlights the gulf between the robust public claims and the actual opinion poll results on which it is based. The science of statistics is all about differentiating signal from noise. This exercise is far from trivial: Although there is enough computing power in today’s laptops to churn out very sophisticated analyses, it is easily overlooked that data analysis is also a cognitive activity. Numerical skills alone are often insufficient to understand a data set—indeed, number-crunching ability that’s unaccompanied by informed judgment can often do more harm than good. This fact frequently becomes apparent in the climate arena, where the ability to use pivot tables in Excel or to do a simple linear regressions is often over-interpreted as deep statistical competence. Now let me put this in context. Statistics is the study of how to collect, organize, analyze, and interpret numerical information from data. So Lewandowsky and Oberauer appear to seem to have a narrow and elitist interpretation. Lewandowsky and Oberauer are cognitive scientists. They are merely claiming that this is within their area of competence. Agreed – but that implies that what follows should demonstrate something unique, they can only be gained by higher level or “scientific” analysis. I would quite agree that pivot tables are not a replacement for deep statistical analysis. But it has role. My analysis using pivot tables, published on 1st September has a number of things which I identified independently which are not brought out in the original paper. These I present below. Then I will suggest how the reporting in the mainstream media might have been somewhat different if they had seen the pivot table summaries. Finally I will make some suggestions as to how the low level statistical analysis can contribute to relating to more “scientific” statistics. It was an internet based survey, with links posted on 8 “pro-science” blogs. Five skeptic blogs were approached. As such, one would expect that “pro-science” responses would far outweigh “denialist” responses. I cannot find the split. On obtaining the data, this was what first looked at. In the posting I looked at the 4 Climate Science questions, classifying into acceptors and rejectors (“denialist”) of the science. Those who dogmatically rejected every question were outnumbered more than 10 to 1 by those who dogmatically accepted. Those who accept the science comprise three-quarters of the respondents. Most people would believe this to be material to a paper analysing those who reject the science. This is the beginning of the title of the paper. Pivot tables are great analysing this. The row labels are “Climate Science Belief”, the columns are CYMoon, and under “∑ values” enter the count of another column of values. After a bit of formatting, and three more columns of simple formulas, I got this. Of the 64 who strongly accept that the climate change conspiracy theory, just 2 also strongly accept CYMOON. Even worse the title is the other way round. So the sample of those who believe NASA faked the moon landings is just 10. The sample size was just too small to make a prediction. Even worse, you could make the wrong result due to the next issue. One test was to look at the average agreement to each of 12 conspiracy theories that were independent of the climate area. So I rounded the average response to the nearest whole number for each respondent. And then did a pivot table. I believe I was the first to identify publically the two that averaged 4 on the conspiracy theories and rejected the climate science. These are the two that Steve McIntyre has dubbed “Super-scammers”. The biggest conclusion that I see is that the vast majority of respondents, no matter what their views on climate, don’t have much time for conspiracy theories. In fact, if you take out the two super-scammers, the most sceptical bunch are the group that dogmatically reject climate science. This is confirmed if you take the average conspiracy score for each group. Taking out the two super-scammers brings the average for the dogmatic rejectors from 1.63 to 1.49. With such small numbers, one or two outliers can have an impact on the data. Are climate sceptics more likely to be conspiracy theorists? Even a paper such as the Guardian, which prints all sorts of extremist dogma in denigrating sceptics, would have thought twice about publishing that comment if they had been presented with the tables. “NASA faked the moon landing – Therefore (Climate) Science is a Hoax: An Anatomy of the Motivated Rejection of Science”, was based on a survey of more than 1000 visitors to blogs dedicated to discussion of climate change. An astute reporter, on the basis of my pivot tables, could reasonably ask Professor Lewandowsky how it follows from just 10 respondents who support the idea that “NASA faked the moon landing” that you can make any sort of prediction about beliefs about climate. The questionnaires were placed on climate blogs, not conspiracy-based blogs, so surely any prediction should be framed the other way round? The lead researcher, Professor Stephan Lewandowsky, from the University of Western Australia, said conspiracy theories are the “antithesis to scientific thinking” and those who believe them are more likely to reject the scientific consensus that humans contribute to climate change. An astute reporter, on the basis of my pivot tables, could reasonably ask why Professor Lewandowsky is still sticking to his hypothesis when such small numbers support the wacky conspiracy theories. They may then ask a supplementary question. Given that there were 15 questions on conspiracy theories (14 with results reported), and just 5 on free markets, was not the original purpose to establish the conspiracy theory hypothesis and the secondary one on political orientation? In summary, whilst would quite agreeing that spread sheet analysis using pivot tables are not a replacement for deep statistical analysis there are a number of ways where it can be a powerful aid. Firstly, it is a quick way of getting a sense of what the data is suggesting. Pivot tables can enable a quick summary visually in lots of different ways. It may need additional classifications, such as my acceptors / rejectors. It also needs thought, and an almost a manic sense of trial and error. Second, it can give a quick comparison to what is being derived from the higher level statistics or modelling. For scientists it is a way of reviewing the data, to make sure that they have the most important points, and have not gone up blind alleys. For non-scientists (and for those scientists reviewing the work of others) it is a way of quickly getting a sense of whether the conclusions are substantiated by the empirical evidence. Thirdly, and most importantly, it is a means of communicating to the wider public. It provides a bridge between the mainstream media and the scientists. If climate scientists want to win the trust of the wider public, then they need to relate their work in more intelligible terms, capable of being cross-examined. Instead we have the high level models and a then lot of shouting about how wrong and biased are any criticisms. That leads to a lot of scientists, including Lewandowsky, who are totally incapable of perceiving that they could be wrong, or that there could be even modicum of truth in what the critics say. This denial is best summarized in the graphic displayed in the Lewandowsky and Oberauer posting of the “skeptics” view on recent warming trends. It is a total misrepresentation, used as a means of avoiding intelligent discussion. In looking analysing the data on the Lew et al paper I made the following comment. If you sample some of their articles, you will find a dogmatic defence of climate change, and blocking, editing or denigration views that are contrary to their own. The claim in the paper that they contacted five sceptical blogs to improve the spread of views is highly suspect. Jo Nova contacted 24 such blogs (including all the most prominent ones), with not a single one remembering such an approach. Prof. Lewandowsky is currently refusing to divulge the names of the blogs contacted. As there was no proper control of the answers, there could be rogue results generated. 1. When will an apology be forthcoming for the accusations launched against me? And how many individuals should now be issuing a public apology? To explore the magnitude of this question we must take stock of public statements that have been made about my research. For example, one blogger considered it “highly suspect” whether I had contacted any “skeptic” sites. It troubled me greatly this comment. Why had I failed to trust the word of a professor of psychology? A science which I have never studied? I will not give excuses, but give the reasons that were going through my mind at the time. Firstly, I was prejudiced against Prof. Lewandwosky. I had first heard of him in relation to the Peter Gleick affair. This was when a so-called scientist impersonated someone else to fraudulently obtain documents from the Heartland Institute. He was “outed” because the key document – which was fabricated – was in the style of Peter Gleick. Yet, Lewandowsky’s believed Gleick’s lying to defend “science” was on the same moral plane as Churchill’s lying to deceive Hitler. Further, he accepted Gleick’s statement that he was sent the forged document in the post. In my eyes that was a choice between strong circumstantial evidence and the statement of a self-confessed liar. Also, for Gleick, admission of fabrication might be a far more serious crime, than his claim to receiving something in the post gullibly accepting it as genuine. So whatever the truth, there might be motive for an additional lie. Further, I do not believe that climate denial is as evil as Nazism. In fact I happen to believe that the term “climate denial” is a vicious smear. Secondly, my prejudices were further exaggerated when I came across a climate opinion survey at “Watching the Deniers” blog. I not only answered this opinion survey, but recorded the questions and commented upon them. When I saw the Lewandowsky paper, with the some of the same questions on free markets and conspiracy theories, I erroneously thought that this was the same questionnaire. In fact, the questionnaire I answered is probably a later development of the survey behind the Lewandowsky paper. Looking at the actual questionnaire, my comments can be applied to the earlier and shorter survey. Thirdly, I saw the paper and read the opening paragraphs. I see Lewandowsky’s belief (and the climate scientists as being) along the lines of climate scientists are the experts with PhDs, and are in strong agreement. I believe that far from the strong foundation sufficient to declare anyone who disagrees a motivated denier of the truth. Fourthly, I am also prejudiced against using psychology to declare that critics sub-normal after reading in the 1980s about the abuses of psychiatry in the Soviet Union, to consign dissidents to mental institutions. Or the arguments the KGB put forward to dissidents of how they could possibly disagree with the huge consensus. Maybe this is an analogy that Lewandowsky will cry foul as one who knows the subject, but this is the honest truth. Fifthly, I then looked at the data. I found a number of misleading statements in the paper, including the small minority of skeptic responses; the fact that the typical respondent wanted little or anything to do with any conspiracy theory not related to climate. In the extreme case of the “NASA Faked the Moon Landings” referred to in the title only 10 responses out of 1145 responses agreed with the proposition. Further, the two dogmatic rejecters of climate science I identified (before Tom Curtis) as being likely scammed. In other words, the dogmatic conclusions rested on little or no evidence. My conclusion was this. Prof. Lewandowsky believes it is alright to lie and smear opponents in his “noble” cause. He has issued a highly prejudiced survey to verify a hypothesis that those who reject what he believes are nutters. He then failed to get a decent sample of skeptics and then failed to filter out the rogue responses. When the vast majority of responses failed to verify his hypothesis, he used the small differences in the minority who believed in conspiracy theories to support his dogmatic conclusions. Yet those could be accounted for by scam responses. On the basis of all this, I had completely lost trust in any statement that Lewandowsky and his mates wrote. I believe I had more than sufficient grounds for suspecting that he had lied about contacting sceptical blogs. What this leads me onto is something that Lewandowsky has completely missed. The claim is that we should trust climate scientists, as they are the experts. But what happens when you betray that trust? Let me give three cases. 1. A business fails to deliver on time and what was specified. Then digs themselves into a deeper hole be making excuses and telling the customer that if they have not broken the small print of the contract. After such an experience would the customer ever trust that business again, even if dealing with a different department or people? 2. Somebody was wrongly convicted of murder due to misinterpretation of the evidence by experts, or tampering of the evidence by the police. After this is exposed, there is no action taken to release the innocent party or to stop these events occurring again. What would happen to people’s trust in the judicial process? 3. After twenty years of marriage, one of the partners sleeps with another. What happens to the trust in the marriage if the guilty partner then makes excuses, including blaming the other? Betrayal of that trust will lead to the betrayer being viewed in a completely different light by the betrayed party. The betrayed now questions every statement and every motive. Once you have lost people’s trust, it is very hard to regain that trust – a point that Dale Carnegie makes in “How To Win Friends And Influence People”. Shifting blame, or failing to acknowledge fault, will only make matters worse. Yet this is what the climate science community has being doing for years. Look at the skeptic blogs and you will find lots of reasons for questioning the science. Some are valid, some are less valid. It is by a group of people that has, with multiple reasons, lost trust in the “science”. The response of the scientists is to call them names, question their motives and (if you look at the skepticalscience blog) provide feeble and biased excuses. By not acknowledging that differences of opinion are possible, or that the science is weak, or that misinterpretations are possible, they are destroying the trust people have in science. In short what Lewandowsky has completely missed is that people reject the “science” because of lack of trust in scientists, for reasons that they believe in. His actions and those of climate scientists are just exacerbating the rift between the climate science community and people who live in the real world. I am not a scientist. But I have a degree in economics and worked for over 20 years in industry as a management accountant, mostly within the manufacturing sector. I am a Christian, who believes that people are fallible. That is human beings are prone to error, whether by design or by failing to perceive whether they are wrong. I am certainly fallible. In fact, my best work has often by analysing figures in different ways, wasting my time going up blind allies, learning and eventually getting to better solutions. But I strongly believe that those who believe themselves to be the most infallible are those who are usually the most wrong. I have used an anonymous handle for various reasons, including that people who support “science” think that is alright to make unsubstantiated character assassinations against those who question them. If “climate denial” is on a par with “holocaust” or “smoking” denial, why not start by referencing the clearest statement of the evidence, rather than past opinion surveys? That is, if direct evidence is available, why resort to hearsay evidence? But if opinion surveys are used, then they should at least be good ones. But the primary references are Anderegg, Prall, Harold, & Schneider, 2010 (Most climate scientists believe in what they do) and Doran & Zimmerman, 2009 (97% of climate scientists = 75/77 cut from >3000 responses). Not when 93% of all respondents gave it a firm thumbs down. When Lewandowsky says over >1100 responses, and only talks about those who “reject the science”, it surely implies that all (or at least the vast majority) of responses were from the people he is attacking? Actually, around 15% of responses were from skeptics, in terms of answers to four “climate science” questions. Professional polling organisations in the UK state these figures. But a scientific journal seems not to have insisted. There are loads of conspiracy theories. But one of the most popular in recent years is something like “Climate denial only exists as a serious force due to significant funding by oil and tobacco interests.” Lewandowsky and his junior partners cannot have missed that one. The basic psychology behind this can be found in “The Debunking Handbook” on the front page of the skepticalscience website. Here is the justification for lying, ad hom attacks and continued government grants to a failed research program. They know the truth, and are claiming a monopoly of that truth. But to legitimately claim a monopoly it is necessary to show the corollary. The corollary is that every person who disagrees with you is wrong on everything. In empirical sciences this leaves no gap for different interpretations from the same data; no gap for the unexplained; no gap for hypotheses or assumptions to be falsified; and no gap for new data contradicting old data or forecasts. Lewandowsky’s opinion poll applies the truth in the “The Debunking Handbook” to justify one version of climate science having a continued monopoly by showing that opponents are a load of undesirable nutters. It is not just full of gaps. Like past claimants to the throne of dictators of truth, he is more wrong than his detractors. But if you do not have a monopoly of the truth in climate science, what is the alternative? What if there is a potential future threat, which is very real, but for which there is very little firm evidence? A tentative proposal will be the subject of my next posting. This is the fourth in a series on Lewandowsky, Oberauer & Gignac – NASA faked the moon landing:Therefore (Climate) Science is a Hoax: An Anatomy of the Motivated Rejection of Science (in press, Psychological Science). This posting is further analysis of the data set sourced by Katabasis. (The data is now available from Bishop Hill) The previous post looked at the conspiracy theory question, whilst this looks at the link that the survey makes between free market ideas and rejection of climate science. From the abstract, this was the primary theme of the survey. world’s climate, segments of the public remain unconvinced by the scientific evidence. the perception of a consensus among scientists. There were relatively few questions to identify the political views of the respondent. works best to meet human needs. important than localized environmental concerns. temperature to some measurable degree. CO2AtmosUp I believe that the burning of fossil fuels on the scale observed over the last 50 years has increased atmospheric temperature to an appreciable degree. CO2WillNegChange I believe that the burning of fossil fuels on the scale observed over the last 50 years will cause serious negative changes to the planet’s climate unless there is a substantial switch to non CO2 emitting energy sources. CO2HasNegChange I believe that the burning of fossil fuels on the scale observed over the last 50 years has caused serious negative changes to the planet’s climate. The answers for the free market questions are from 1 (reject the free market) to 4 (complete agreement to free market). The answers for the climate science questions are from 1 (totally Reject) to 4 (complete agreement). As in my previous posting, for the Climate Science questions I graded the answers to the four questions into groups based on the average score. The answer is clear from the poll results. The stronger the support for free markets, the more likely one is to reject the climate science. Taking the average score and rounding to the nearest whole number, the picture is even clearer. The more free-market the views expressed, the greater the rejection of the science. Does this substantiate Lewandowsky et. al’s assertions? There are some series issues with this result. If you sample some of their articles, you will find a dogmatic defence of climate change, and blocking, editing or denigration views that are contrary to their own. To regularly trawl through articles that you disagree with takes a certain kind of person that may not be representative of the wider sceptic community. Given that the sceptic blogs attract a wider audience than the “pro-science” ones, the fact that only 15% of responses were from sceptics says that only a minority regularly visit the blogs antagonistic to their views. In other words, the survey is not representative of the true population of those interested in the climate change / global warming issues. Then there are the questions themselves. At first glance the questions do not allow for the middle ground. Many sceptics who are not libertarian in outlook have then a number of options. Some might quit the survey in disgust, thus creating a sample less representative of the true population. There was no record kept of the numbers of part completed surveys, nor the point at which they were completed. The lack of neutrality and narrowness of the range of questions suggests that might be material. The second is to answer questions in opposition to the climate consensus. That is the join in coalition to free-marketers to oppose the environmentalist ideology. This is quite logical. Environmentalist ideology can be viewed as increasing authoritarianism, constraining economic growth (and thus the prospect of ever-rising standards of living) along with regressive cost increases in electricity and fuel for cars. In other words, those who want the status quo to be maintained join in coalition with those who want the direction of change to be the opposite of where environmentalists are pulling. There is no risk here for the moderates. Libertarianism is nowhere a major political force. Let us look at the average response for each question to see if this is suggested. The most pragmatic question is the least polarized. People may support a position ideologically, but will compromise if there is a demonstrable need or benefit. Conversely the last two questions are the most ideological. A lot of people are motivated to oppose a movement that is contrary to their own beliefs. In other words, the nature of the questions further drives people into opposing camps. How should Lewandowsky have approached these problems? If he was an objective scientist, Lewandowsky would have sought advice from professional pollsters on the content of the questions. They would have advised more neutral, and a broader range of questions to enable people to express a range of views. They would have also advised validity checks to make sure the survey results were representative of the population at large. But Stefan Lewandowsky is not an objective scientist. His agenda is to prevent any opposition to the ideology he and others promote. Are there any conclusions to be drawn? The biases in the free market questions apply to those who reject climate science. However, as a survey of those who accept the climate science, it is more valid. The sample size of 854 is quite large, and more than six times the size of those who reject climate science. Secondly, the sample is likely to represent the true population of “Acceptors”, as it was placed on the blogs that they frequent. Thirdly, as the survey was devised by people sympathetic to their point of view, the abandonment rate should not have been any higher than for more neutral polls. The major conclusion is that those who “accept the science” have no truck with conspiracy theories. On political opinions, they strongly support an ideology which promotes the environment at the expense of economic growth and economic freedoms. That is the, planet should be given a higher priority relative to the people that live on it. Thus the true result of the survey data is not that those who oppose climate science are nutters. Rather, it is that those who support climate science have views that are at odds to, and contrary to the best interests of, the vast majority. We have not got here the justification to silence the opposition, but giving them due weighting. A month ago made two postings on the paper Lewandowsky, Oberauer & Gignac – NASA faked the moon landing:Therefore (Climate) Science is a Hoax: An Anatomy of the Motivated Rejection of Science (in press, Psychological Science). In the first I showed that an opening statement about the beliefs of climate scientists was not supported by the references. The second raised some questions, which owing to a lack of data I was unable to answer. When Katabasis offered in the comments at Jo Nova’s blog to provide the raw data for the paper I took him up on the offer. The articles that have appeared in the Guardian and Telegraph newspapers. The lead author, Prof. Stefan Lewandowsky has a history of dogmatically defending climate science, often by attacking the opponents. However, that is no reason to reject the results of a published scientific paper if those results are substantiated by the evidence. If you sample some of their articles, you will find a dogmatic defence of climate change, and blocking, editing or denigration views that are contrary to their own. The claim in the paper that they contacted five sceptical blogs to improve the spread of views is highly suspect. * Jo Nova contacted 24 such blogs (including all the most prominent ones), with not a single one remembering such an approach. Prof. Lewandowsky is currently refusing to divulge the names of the blogs contacted. As there was no proper control of the answers, there could be rogue results generated. CO2TempUp I believe that burning fossil fuels increases atmospherictemperature to some measurable degree. The answers were from 1 (totally Reject) to 4 (complete agreement). I found the average score for each respondent, graded and plotted the count. As to be expected from the nature of the blogs where it was published, more than 4 in 10 gave the highest score and 85% are more positive than negative in their beliefs. The poll only includes 125 or 175 responses of those who “reject the science”. The survey is about those who reject the science being more likely to believe in weird conspiracy theories than acceptors of the science. As Jo Nova puts it, the climate sceptics are meant to be nutters. There were 14 conspiracy theories presented. Two (on New World Order and Climate Change) I will leave out for now as they are not entirely independent of the subject. Of the 12 remaining I took the average score. If the general hypothesis is correct, the more strongly the rejection of the science, the greater the score on conspiracy theories. There is no significant relationship here at all. The typical respondent gives little or no credence to conspiracy theories. To understand this better, I rounded the average score for each respondent to the nearest whole number. The pivot table is now. There is no relationship here. The outlier is the two respondents with an average score of 4. One put a 4 for all, and the other put 4 on 11/12 and 3 on the other. These are clearly rogue responses and should have been removed as outliers from such a small sample. If removed, the average conspiracy theory score for those who dogmatically reject climate science conclusions drops to 1.49, the lowest of any group. Maybe the correlation was with the Climate Science Conspiracy Theory? If you take out the two rogue responses, then if any comment were to be extracted it would surely be the other way round. However, it is not significant, and internet responses get some rogue results on all sides. Finally, the two conspiracy theories not included.